You criticize, you ostracize, poke and prod – place the blame, on the shoulders of the humans of this race who don’t carry your weight with you or share in your convictions. I don’t understand when political affiliation dictates your personal beliefs. There is a force beyond this life, way beyond space and time that reflects a nature of goodness, whether we want to accept it or not. If you ask me the conservatives are the one’s hiding the most skeletons, and the leftists “slobs” are the ones who lay it all out on the table, they let you see what they are. Though it would ignorant to view as a whole political affiliation has anything to do with how an individual lives their life. I find most views like this, a reverberating echo of my cynicism, an experiential verbal frustration with my existence thus far. I have a kind of love/hate relationship with the Horror genre of films, particularly because of; while I wish to be entertained by excellent cinematography, acting etc. I think my most revered motive for Horror, is to be thoroughly evoked by the message and a emotional response from within self, through the characters and/or story-line. Though I am a fan to a certain extent to some sleaze and gore, if its intention is not to be taken seriously, and its theatrics are so over the top, there is absolutely no intention to involve the viewer in a realistic pretext. I want to clarify this maybe minute detail, primarily with the recent convention of Horror films, absolutely with no other intention to shock, and appall the viewer. At least in the regard of a social sense. That being said, I suppose I had the idea that Martyrs would fit in the later. 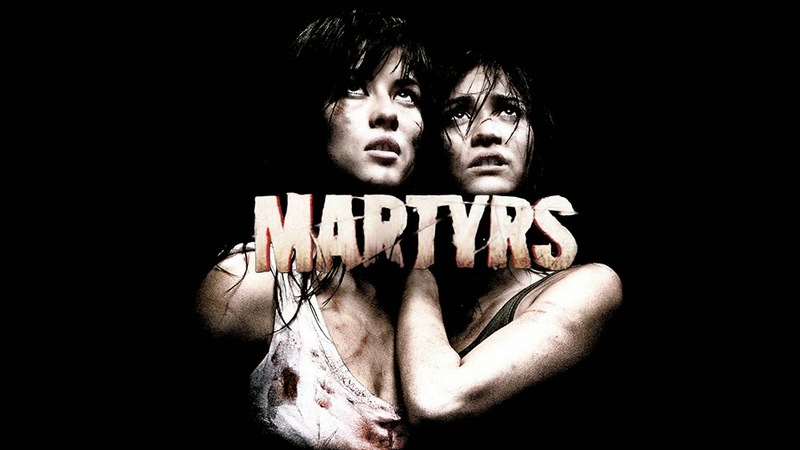 Martyrs was able to evoke a emotional response from me, from the characters involved, as well as engross me in the story-line and develop a deep interest in the subject matter. It’s a very nihilistic film, it absolutely abandons social regard for life, all the while deeply involves it self in meaning of existence. A almost contradicting statement. And though the ending does not answer meaning (more contributes to lack of meaning), it does create an emotional response, which to me brings more meaning to the human experience. Whether intentional or not, this could be something esoteric, and subjective from each individual. The overall premise of the movie involves an organization of people, a council, who is seeking to find whether there are any real martyrs (witnesses) who can point to any kind of semblance of divinity to what awaits humanity at the end of life. Or if all who are subjected to great amounts of human torture and sacrifice are nothing more than victims. They look to the tortured and those at the threshold if they can give any kind of insight into the other side. Herein to me lies a loophole of the plot, that I think is too identifiable to dismiss. For starters they mention that Lucie suffered from battling with an imaginary apparition who would cause her to go into fits of self inflicting punishment, but it’s obvious that she developed this mental degradation through being held captive and tortured in the first place. When Mademoiselle is speaking to Anna she mentions that all cases are “victims” and only 4 could be classified as Martyrs. If Mademoiselle comes to the conclusion she does at the end of the movie from Anna’s insights than how could she not have came to the same conclusion with the last 4 test subjects? These are the two biggest questions I have about this film. I only watched this once, so I do believe a 2nd viewing is in course, just to try and clear up any loose ends in the movie. But this film did accomplish more for me, than what I had originally expected. With all of the press the film got I was expecting a gore feast with absolutely no redeeming story or purpose to the film. Other than to subject the viewer to agonizing scenes of torture and gore. What I took away from this film was transcendental almost philosophical and less to do with gore and horror. It had the same effect as watching a good drama. Was there gore and unforgiving scenes of violence? yes, did it have meaning in purpose, in some cases yes, in most no. Overall I quite enjoyed this movie. Maybe piece this together in a more coherent review later, but just felt impelled to write this. I have been on a long hiatus due to what I would like to call a sabbatical. Yes a pilgrimage through this journey known as life. For whatever reason I have left my absence without any warning, and that was only out of realistic knowledge as to of the audience this blog attracts, or in this case, lack thereof. If anyone reads this, please leave me a comment. ANYTHING. I want some kind of adulation. I believe it’s deserved.